One of the most important Coptic heritages preserved from the first millennium AD until today is the library of the so-called White Monastery in Sohag, Upper Egypt, also known as the Monastery of Apa Shenoute (ca. 361/62–465). The White Monastery library is highly important for Coptic Studies due to its large quantity of Sahidic parchments (ca. 10,000 leaves), their literary richness and the variety of manuscripts date back to the time between the 8th and 12th centuries. The present project focuses on the works of a lesser known Coptic author, Apa John the Archimandrite (abbot), who is a successor of Shenoute and Besa, the most famous archimandrites of the White Monastery. Archaeological and liturgical sources let assume that Apa Joannes led the monastery either in the 6th or the 7th century. Apa John addressed the members of the monastic community with his canons (= monastic exhortations) which contain threats of punishment and warnings of judgment for sinners. Some of them made prayer, fasting, and obedience a subject of discussion, while others opened with a list of virtues by which Christ’s reward may be received. There are no extant witnesses to discourses or letters written by Apa Joannes. This situation most probably reflects the insufficient stage of preservation of the manuscripts. Apa John’s canons are preserved on parchment manuscripts from the 8th–11th centuries from the White Monastery library. Discovered to date are 206 surviving leaves and fragments with the canons of Apa Joannes. They belonged to five codices for which designation the project uses the sigla of the Corpus dei Manoscritti Copti Letterari (Tito Orlandi) — MONB.FA, MONB.OD, MONB.XQ, MONB.YI, MONB.ZK. 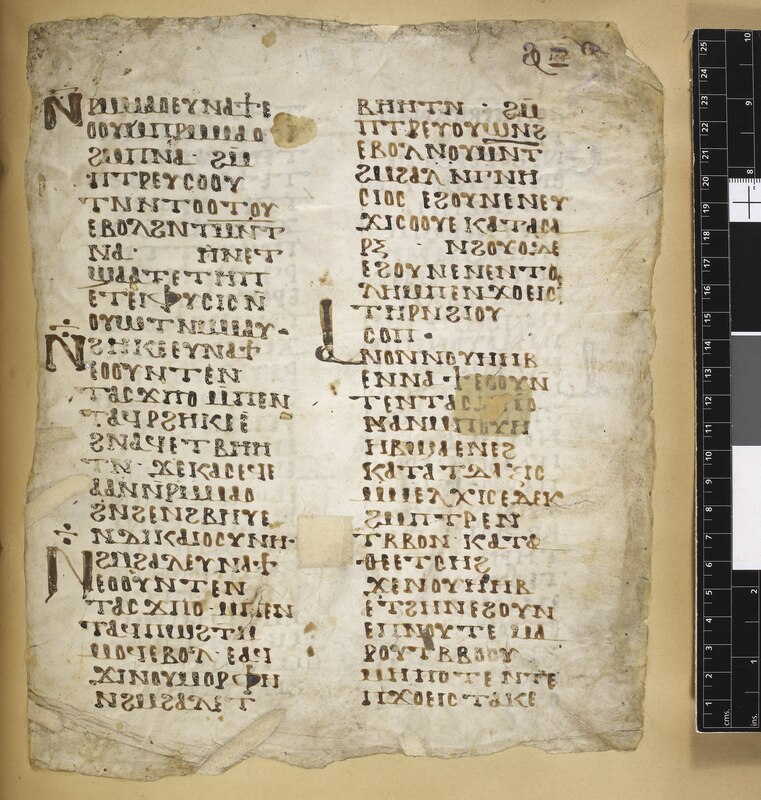 The parchment codices MONB.XQ and MONB.ZK with unimodular script are from the ca. 8th–9th centuries, while the parchment codices MONB.FA, MONB.OD, and MONB.YI with bimodular script can be dated approximately into the 10th – 11th centuries. The project makes a contribution to the investigation into the canons of Apa Joannes the Archimandrite and to the structure and language of the genre “canon” in Coptic Christian literature of the first millennium. It will provide a first complete diplomatic edition with an English translation of these canons. It helps to explore, preserve, and illuminate the heritage of the White Monastery as well as the Coptic tradition as a whole. Last but not least the project delivers important data for Digital Humanities in Coptology. The research institution that carried out the project from 2011 until 2015 was the Department of Biblical Studies and Ecclesiastical History in close cooperation with the Center for the Studies of the Christian East, both institutions of the Paris-Lodron-University of Salzburg.